A young boy set out to preserve what he loved. Mohammed Kteish, with dreams of one day being an architect, reconstructed a model of his city Aleppo. 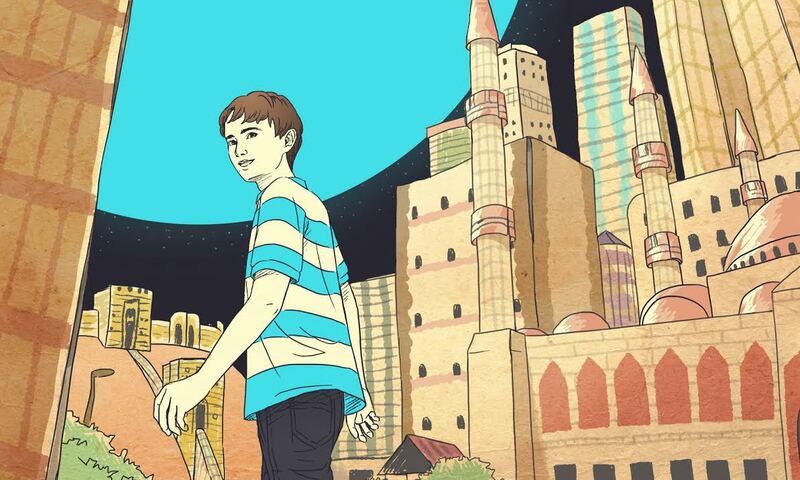 For his own safety, Kteish had to leave behind his home and his model city. Commissioned by Sheffield Doc/Fest, Alex Pearson and Marshmallow Laser Feast have rebuilt Kteish’s cityscape both physically and virtually in Future Aleppo. Consisting of paper buildings, recycled miniature car models and tinfoil roofs, it stands as a testament to the power of preserving memories: though Aleppo may be irrevocably changed from the city it once was, it endures in Kteish’s and the artists’ preservation. There’s an underlying sense of strength in the work. Though the buildings may be made from something as fragile as paper, the attention to detail such as solar panels and a helipad, suggests that its power lies in how well it is remembered. The piece spans two square metres, detailing landmarks such as a mosque, a church and a football stadium. Making the memory more tangible, a virtual reality headpiece accompanies the model city, allowing visitors to explore from a more human perspective. After briefly soaring over the model, visitors are transported to different parts of the city such as Kteish’s home and the park where he used to play. During the video, Kteish recounts his experiences, sharing and solidifying his memories. It’s important that the art exists as a physical space where memories can be preserved. The artists intend on developing the VR simulation into something more interactive and comprehensive, taking Future Aleppo to schools and refugee camps in Turkey to encourage other children to continue dreaming of a better future for their homes. Future Aleppo acts as a collective memory, which the artists plan on furthering by allowing others to contribute to and share their experiences of Aleppo. Although Kteish may have had to leave behind his original model of Aleppo, Pearson and Marshmallow Laser Feast have provided others with the opportunity to share in Kteish’s memories and his dreams. Future Aleppo provides a way in to a memory that wasn’t necessarily lost, rather, it was waiting to be shared. The artwork encourages us to invest in someone else’s story, to look outward and to collaboratively build a memorial for what Kteish and so many others have lost. A website detailing the project offers a deeper look into Kteish’s story. The artists have created a Scholarship Fund to support Kteish’s dream to become an architect, allowing anyone to donate towards his future. Future Aleppo is on display at FACT until 18 February 2018. Callan Waldron-Hall is a Liverpool-based writer and is studying for an MA in Poetry at Manchester Metropolitan University.